When Mylan CEO Heather Bresch recently testified before the House Oversight Committee, she claimed that the company only made $50 per EpiPen, in spite of charging $608 per two-pack of the emergency allergy medicine. Mylan then said it makes around $80/EpiPen — a figure that lawmakers still doubted. Now the leadership of the Oversight Committee is asking Mylan to clear things up for everyone by turning over documents that actually show how much the company makes from EpiPen. Taxes are at the heart of this particular dispute. When Bresch gave the $50/EpiPen profit figure to Congress, she didn’t mention that this was a post-tax figure. Additionally, it was later learned that Mylan had used the statutory U.S. tax rate of 37.5% to calculate that figure, even though Mylan likely paid significantly less than that rate. 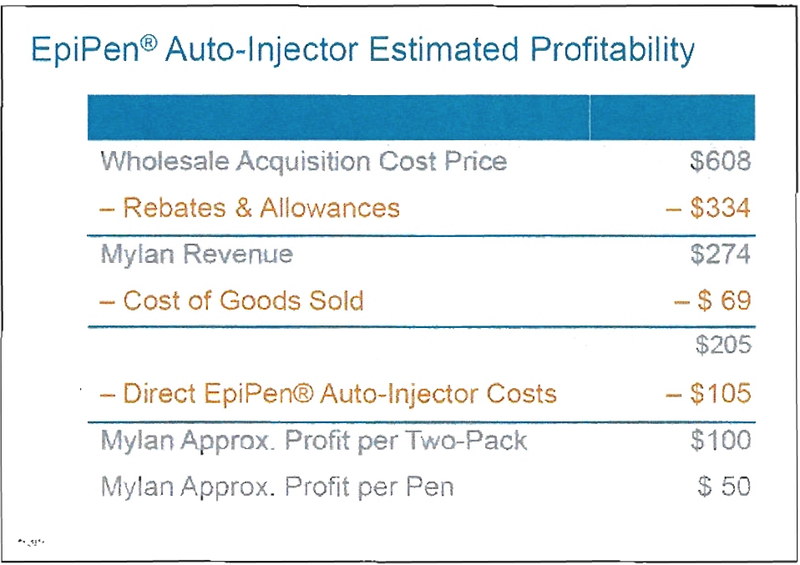 In a letter [PDF], sent to Bresch on Friday by Committee Chair Jason Chaffetz (UT) and Ranking Member Elijah Cummings (MD), the lawmakers note that during the CEO’s testimony she regularly referenced a chart (seen here at right) that breaks down the purported costs and profit from EpiPen, but only mentioned taxes when talking about the company’s money-saving decision to relocate Mylan’s headquarters overseas. “Failing to disclose tax assumptions that formed the basis of the $100 profit per pack claim, despite opportunities to do so before and during the hearing, raises questions,” reads the letter, which reminds Bresch that Chaffetz and Cummings each voiced disbelief about these “dumbed down financials” shown to the committee. Because of the apparent lack of transparency from Mylan, the letter seeks information that paints a more accurate and precise picture of the costs associated with EpiPen. The committee is seeking any internal analyses or memos related to “EpiPen sales, profits, costs, manufacturing, distribution, or any other subject that could impact the costs or profitability of the drug-device combination,” along with five years of profit and loss statements for EpiPen. Instead of the vague chart provided to Congress, the letter calls for Mylan to provide a year-by-year breakdown on 18 different costs and revenue streams — including the controversial EpiPens4Schools program — since the company acquired EpiPen as part of its purchase of Merck’s generic drug business nine years ago. With regard to taxes, the committee wants to see evidence of Mylan’s actual tax rate and taxable income in the U.S., and the amount of its U.S. income paid to the IRS each year since 2007. Chaffetz and Cummings also want to know how much Mylan charges for the EpiPen in the Netherlands, along with supporting documentation. Finally, the letter asks Mylan to identify all employees involved in classifying EpiPen with Medicare/Medicaid as a “multiple source drug,” meaning the company pays a lower rebate, even though EpiPen currently controls some 95% of the epinephrine auto-injector market. This last issue is already being investigated by the West Virginia attorney general, and several U.S. senators have called for the Justice Department to investigate possible fraud. Mylan has until Oct. 7 to respond to the lawmakers’ request.